Discussion in 'College Football Stars' started by dolphins15, Jul 18, 2018. Nick Bosa (JR) 6'4" 265 Ohio State. A dominant player, projected to maybe be the first player taken in the draft. He had 8.5 sacks last season with 16 TFL's. Sutton Smith (JR) 6'1" 237 Northern Illinois. MAC defensive player of the year. Broke NIU's sack and TFL single season records. He had a amazing season and is very fast off the edge. A former high school RB showed off his speed taking a fumble to he house last season. Zach Allen (SR) 6'5" 285 Boston College. One of 2 DL to have 100 total tackles nationally. Added 6 sacks. Should be a 1st rounder next year. Chase Winovich (SR) 6'5" 253 Michigan. Very productive player with 79 tackles, 18 TFL's, and 8 sacks. Should be in for another big year and go in the early rounds. 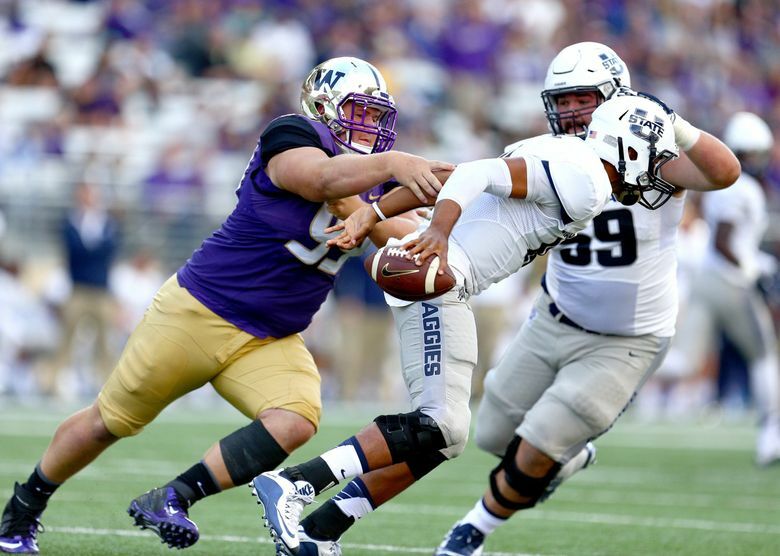 Greg Gaines (SR) 6'2" 313 Washington. He was 2nd team All Pac-12 after being honorable mention the year before. A big time force for the huskies. Nice group! Bosa and Allen should be no doubt 1st rounders. Joe Gaziano (JR) 6'4" 280 Northwestern. He led the Big Ten with 8 sacks in the regular season and was 2nd team all Big 10. Anthony Nelson (JR) 6'7" 270 Iowa. 3rd team All Big Ten. He has 17.5 career TFL's and 13.5 sacks. Kenny Willekes (JR) 6'4" 250 Michigan State. A former Walk-On who was 3rd Team All Big Ten last season. He had 7 sacks and 4 TFL's last season. Hunter Snyder (SR) 6'6" 270 FAU. Honorable Mention C-USA last season after making 57 tackles and 6 sacks. Wow, checking out that highlight of Sutton Smith, he's a defensive end who runs like a defensive back! Don, he really can. I was watching that game and had to rewind it to show my dad about this kid. I'm glad it's working out for him so far. But I bet he could have made a great RB. This is a good article about his story. 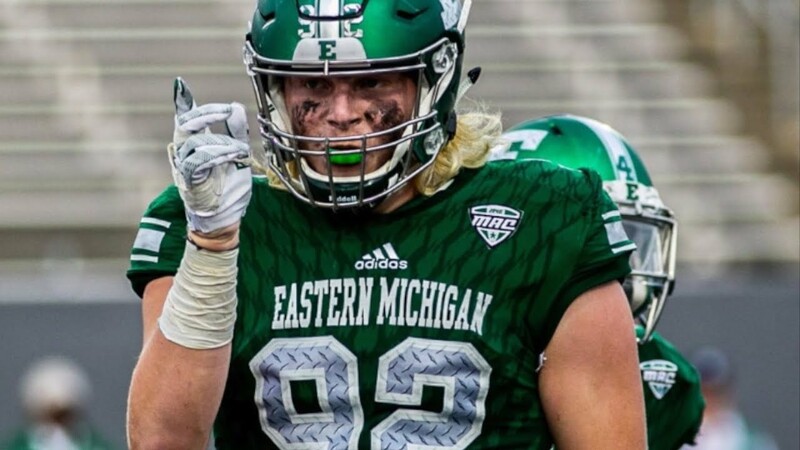 Maxx Crosby (JR) 6'5" 247 Eastern Michigan. He was voted Eastern Michigan's team MVP last season. He was first team All-MAC. He's on Bednarik watch list. He had 11 sacks and 16.5 TFL's in his first season as a starter. Very solid crop of D-Lineman! Bosa Top 5 (see brother Joey) ; Zach Allen 1st Rounder in Top 20 for sure! NT-Gaines & DE/OLB Winovich could go in the 2nd Round...as well as former RB Sutton Smith who projects as OLB in NFL....remember following him out of HS hoping he'd stay at RB. He sure has found his niche as an explosive playmaker on Defense! Carter Coughlin up to 22 Tackles, 9.5 TFL, 7 sacks and 2 FFs. Extremely impressed with his effort against Ohio St. He was blowing past their OL with ease and apparently everyone else's! What do you guys make of Iowa DE AJ Epensa, who seems to be a mixed mestizo? He has 9.5 Sacks this season, and is projected to be a 1st-2nd round pick in 2020. Given he's not poly and has a white mom, where does that put him in caste terms?? Epenesa is a good player but I wouldn't consider him close to being White. Epenese is a good player but not white - you can hear the contrast during Iowa games when they talk so glowingly about him while throwing the same cliches towards the Nelson brothers and Parker Hesse. Taylor Rapp - also won't consider him to be a white athlete come the draft. Sully Laiche (Jr.) - Nicholls in Louisiana ...undersized at 6'-2" 270lbs ...but he's a Pit Bull + Squats 600lbs...first play vs. SEC Georgia last season was Tackle for Loss...handled FBS Kansas this season too! He has 25½ sacks in three seasons, which ranks third on the active FCS list. This season, he has 16½ tackles for losses, 8½ sacks and two forced fumbles. He is on the Buck Buchanan Watch List for the best defensive player in the FCS. At Lutcher High School, Sully Laiche was a three-time district defensive most valuable player, was three times All-State and was chosen Class 3A defensive MVP as a senior. However, when it came to scholarship offers, the big schools didn't really bite. Laiche says he squats 600 pounds. To him, his lack of height is an advantage. On the line, often, the low man wins. Laiche can get under an offensive lineman's skin in more ways than one. He uses a battery of moves — the swim, bull rush, push-and-pull, pull-and-bob and rush-by — to get 300-plus-pound opponents off-balance and beat them. He has 25½ sacks in three seasons, which ranks third on the active FCS list. This season, he has 16½ tackles for losses, 8½ sacks and two forced fumbles. He is on the Buck Buchanan Watch List for the best defensive player in the FCS. Great find Twenty-Two! One to keep an eye next year for sure.